****Open to US and Canada only. Giveaway ends on 9/28/2018. As crocheters, we all love yarn and the uniqueness of our handmade products, don’t we? Then how about a handcrafted hook organizer for our precious hooks? This wooden workstation is compact and crafted to perfection from Red Oak wood. This is truly an heirloom piece that can be passed down the generations. It can hold a full set of steel hooks on the back tier and a full set of Susan Bates, Clover Amour, Tulip, or Cheffort Comfort Grip Hooks in the front. All your hooks will be in one place at last. What’s more? The Chetnanigans have put so much thought into it, it can even hold your other crochet tools like yarn needle, scissors, measuring tape and stitch markers. How convenient! You get these accessories free when you purchase this workstation for your hooks. Chetnanigans is owned by Sean and Holly. They take pride in providing over 80 different, solid wood, Fiber Arts solutions to their customers. 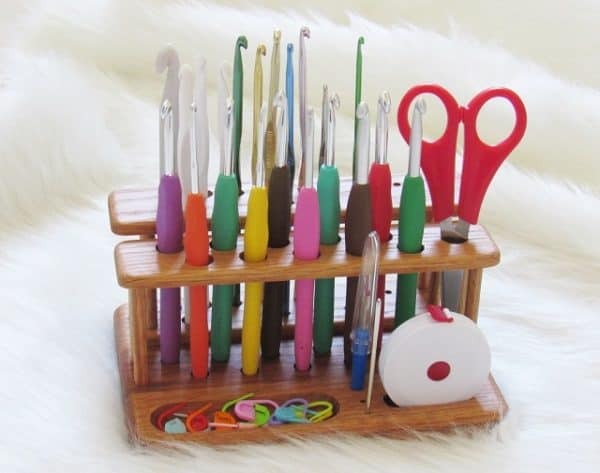 Chetnanigans was created based upon the need for a sturdy Hairpin Lace Loom and quickly grew into hook organizers, pattern readers, looms, magnetic blocking boards, and other Fiber Arts solutions. Kindly visit their shop and support their small business. You can like their Facebook page here and their Instagram page here. Disclosure: This giveaway is very generously sponsored by Chetnaningans. The opinions expressed are entirely mine. 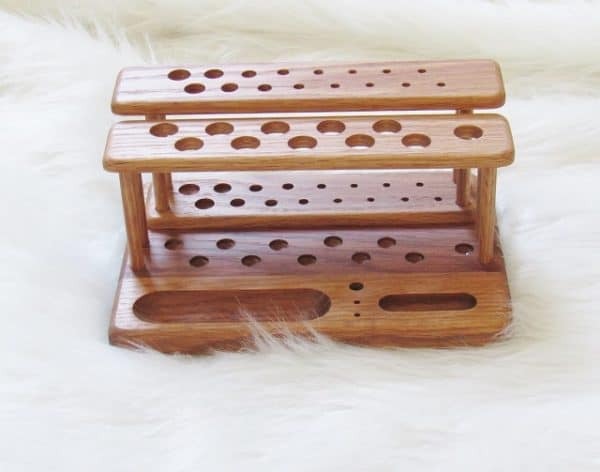 Enter your email below for a chance to win this heirloom organizer. Your email will only be used for the giveaway. Only your email is mandatory, but the second option will grant you an additional entry. I am glad you like it. It really is an heirloom piece made with lot of love and care. Yes I would love to win this. I can never find all of my crochet hooks. Hi Lisa, I hope you entered your email in the Rafflecopter box above. Best of luck in winning the organizer. 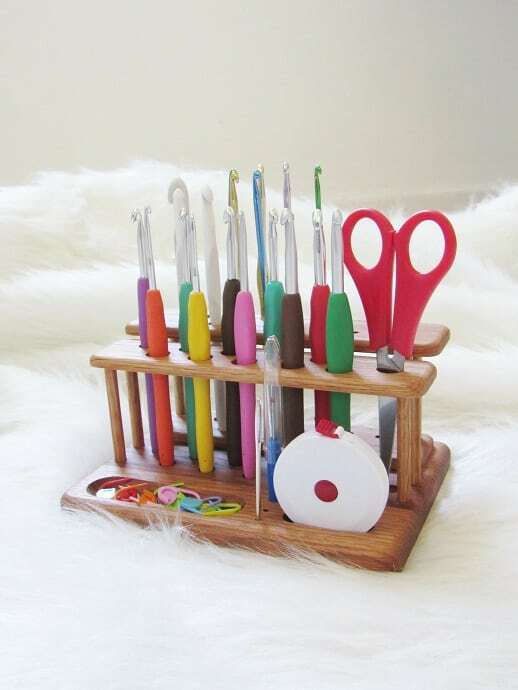 This would be so wonderful to have, I can never find a crochet hook when I need it. They are just all over the place. Thank you for this contest! Hi Nancy, you are very welcome. I am super excited to offer this Giveaway and introduce Chetnanigans to you. They have a very unique small business tailored to crocheters. Thanks so much for the ‘Giveaway’ offer! Very nice, and looks very ‘User Friendly’! Hi Kimberly, you are very welcome. Love these organizers! Just beautiful! Hi Dawn, I am glad you like them. I was impressed with the craftsmanship. It is truly an heirloom piece. This is thoughtful. It’s a beautiful and creative idea. Hooks do need their place and it’s not in the couch cushions lol. I hope that the winner enjoys. thx for having a contest ! What a great gift (Giveaway). A must have for all crochet addicts. Thank you for the opportunity to enter.